Drivers are now using the first section of new road constructed under the Kincraig to Dalraddy section of the A9 dualling project. 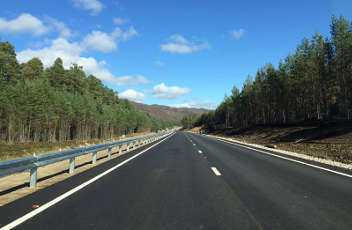 The 4km of newly constructed carriageway is part of the 7.5km Kincraig to Dalraddy section of the £3bn dualling project, which will upgrade 128km of single carriageway along the A9 between Perth and Inverness by 2025. The new stretch of road surface is being used by traffic in both directions, allowing the contractor - a Wills Bros John Paul Joint Venture - to turn their attentions to upgrading the existing carriageway. Keith Brown, cabinet secretary for economy, jobs and fair work said: ‘As one of Scotland’s largest and most challenging infrastructure projects, I welcome this important milestone in our A9 dualling programme, with the first stretch of new road in the programme between Kincraig and Dalraddy now in use. ‘Along with the ongoing construction work, we are also continuing to progress the design of the other sections to be dualled with three ground investigation contracts awarded in the last few months. These important investigations are helping to inform and shape the design as we work towards identifying preferred routes for a number of sections to be dualled. Transport Scotland said the Kincraig to Dalraddy project remains on schedule for completion in Summer 2017. Drivers should be aware that further changes to the road layout will continue to be rolled out over the coming weeks and should approach this section of road with care. Road Expo is one of Scotland’s largest transport and road conference and exhibitions and takes place on the 2-3 November in Edinburgh this year. The event will feature more than 100 exhibitors and two CPD certified seminar theatres, curated by Transport Scotland and SCOTS. To book your free place register here.